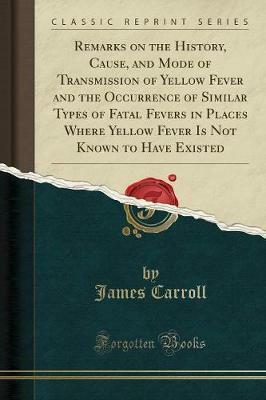 Excerpt from Remarks on the History, Cause, and Mode of Transmission of Yellow Fever and the Occurrence of Similar Types of Fatal Fevers in Places Where Yellow Fever Is Not Known to Have Existed I have quoted this at length because his classical descrip tion of the symptoms of the disease shows that he was a close and careful observer, and it is certainly interesting to learn that he regarded the bilious remitting fever as simply a milder form of yellow fever. Dr. Benjamin Rush adds in a foot note: There can be no doubt of the truth of this opinion from Dr. Huck, a physician whose talent for observation and discrimination were well known to the editor, (dr. Rush.) It would certainly seem then that bilious remittent fevers, epidemic in character and accompanied by jaundice, of short duration, occurring on vessels, in seaport towns and along the lines of travel from them, are closely related to, and probably identical with yellow fever. About the Publisher Forgotten Books publishes hundreds of thousands of rare and classic books. Find more at www.forgottenbooks.com This book is a reproduction of an important historical work. Forgotten Books uses state-of-the-art technology to digitally reconstruct the work, preserving the original format whilst repairing imperfections present in the aged copy. In rare cases, an imperfection in the original, such as a blemish or missing page, may be replicated in our edition. We do, however, repair the vast majority of imperfections successfully; any imperfections that remain are intentionally left to preserve the state of such historical works.